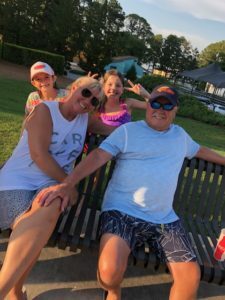 Posted June 28, 2018 by Bailey Heard & filed under Blog, FeaturedOnHomePage. 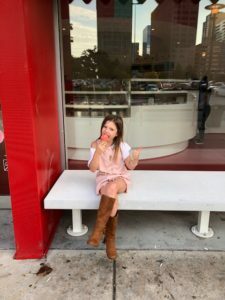 A couple of weeks ago my daughter, Ellie, and I went on an adventure to Nashville, Tennessee (see last week’s post, Nashville Trip – Part One for the first half of our trip). The second part of the week we flew to Atlanta to spend time with my sister, Melanie, brother-in-law, Bolling, and niece, Isabelle. Not knowing Atlanta was only a three hour drive from Nashville, I flew back to Dallas and caught a flight the next day to Atlanta. Geography’s never been my strong suit, but it would have saved me a lot of money and time had I just looked at a map. Hindsight is always 20/20. 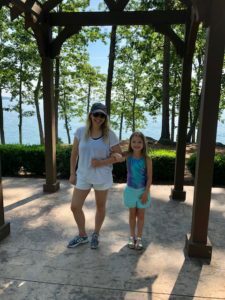 Once we were in Atlanta, Ellie had a blast running through the woods, getting muddy, and catching fireflies with Izzy and her neighborhood friends. The next day we all drove to Lake Laniere and met up with my parents for Father’s Day weekend. We started off by heading to the waterpark on the lake. We spotted two waterslides side by side that looked pretty fun and not too fast, which was important because Ellie is terrified of waterslides. Somehow Ellie agreed to try it, but the further up we walked, the more afraid she became. I noticed some people went down on their backs and others sitting up. I figured sitting up would be slower, so I told Ellie to just sit up. When it was our turn to go she was a little nervous, but we both went on the count of three. From the second I took off I knew it was a bad idea. I was bouncing all over the place and my bum was coming off the slide. All I could think was, Holy crap, if I’m going this fast, Ellie must be flying and freaking out. By the time I got to the bottom and fished out my hat, which had flown off, I heard loud sobs coming from the slide next to me. I ran over to Ellie, picked her up, and held her while she told me how fast it was and how she’d hit her head on the side of the slide. On Saturday evening we decided to celebrate Father’s Day at a nice steak house in downtown Beauford, Georgia. We got there early and shopped around the square. When it was time for our reservations we walked to the restaurant. As soon as we sat down, a waiter came over to me and asked me if he could shake my hand. I thought, Oh, man, this is going to be awkward— he thinks I’m someone else. So I was preparing myself for the usual dopplegänger effect when the waiter introduced himself and told me how he used to follow my blogs. He’d said he didn’t recognize me at first, but he’d recognized my parents because of a real estate investment conference call I did with them years ago that he had called in to. I could tell he was in complete shock God allowed our paths to cross in person, as was I. We talked a little longer and then he had to get back to work. He was kind and bought Ellie and me some dessert and at the end of the night we went up to thank him and say goodbye. I left the evening filled with gratitude that our journey and my writings had touched this man’s heart and meant something to him. This trip gave me so much to be thankful for and I loved every second spent with my family. 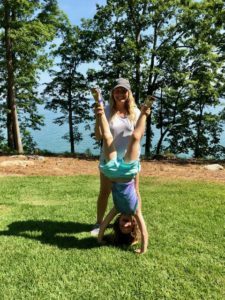 From Nashville to Atlanta, Ellie and I created some great memories.